There have been twenty games played in the Premier League over the last week, so here is a rundown of how results have left the table. Chelsea remain the clear favorites for the title, but their 0-0 draw away at Sunderland allowed Manchester City to cut the gap to the leaders down to six points. They did so by beating previously-second Southampton 3-0 at St. Mary’s, then on Wednesday they overcame a bogey fixture by beating the Black Cats at the Stadium of Light, a ground where they had lost their last four league matches 1-0. That same evening, Chelsea maintained their 100% home record and dominance over Spurs with a 3-0 victory at Stamford Bridge. With Diego Costa suspended for amassing five yellow cards – though he should have received a red one against Sunderland – Didier Drogba and Loic Remy both got on the scoresheet, adding to Eden Hazard’s opener. This weekend, Manchester City host Everton, while Chelsea are back in the North-East, this time to face Newcastle, who have beaten the Blues in their last two meetings at St. James’s Park. For much of the early running, Southampton have been Chelsea’s closest challengers at the top of the table, but a tough run of fixtures has seen them drop to ten points behind the leaders, while those behind them in the table are closing in on the Saints. They followed up their home defeat against Manchester City with a 1-0 defeat at the Emirates, with Arsenal scoring a very late winner. Those three points showed the resilience of the Gunners this season, who also beat West Brom by the same scoreline last weekend. It was the fourth time this campaign that Arsene Wenger’s men have picked up points with goals scored in the 89th minute or later – as they did so in their 2-1 win against Crystal Palace and 2-2 draws with Everton and Hull. Without those additional six points, Arsenal would be in 12th place and any Champions League aspirations would probably be beyond them. Many consider Wenger’s teams to have a weak mindset and be prone to collapses, but there is a clear battling quality to this side that has kept them in contention for a top four spot. Manchester United remain in that crucial fourth place after they picked up six points from their two home matches against Hull and Stoke City. They were fortunate to get the victory against the Potters, as David De Gea had to make a couple of fantastic saves in the final minutes to keep out an equalizer, then Ashley Young cleared a shot off the line. A point behind United are West Ham, who also got two wins in the last week, beating Newcastle 1-0 at Upton Park, then coming from behind to defeat West Brom 2-1 at the Hawthornes on Tuesday night. With Arsenal in sixth place, Swansea are now down in seventh following their 1-1 draw at home against Crystal Palace last Saturday, though they did stay within three points of the top four with a 2-0 victory over Queens Park Rangers in midweek. This weekend, four of these five teams face each other: Southampton host Manchester United on Monday night, a match that his crucial for the Saints to win if they want their Champions League aspirations to be taken seriously; and Swansea are in East London to face West Ham. With those sides sure to take points off each other, it gives Arsenal an opportunity to push their own cause forward, though they have a tough trip to play Stoke at the Britannia Stadium. 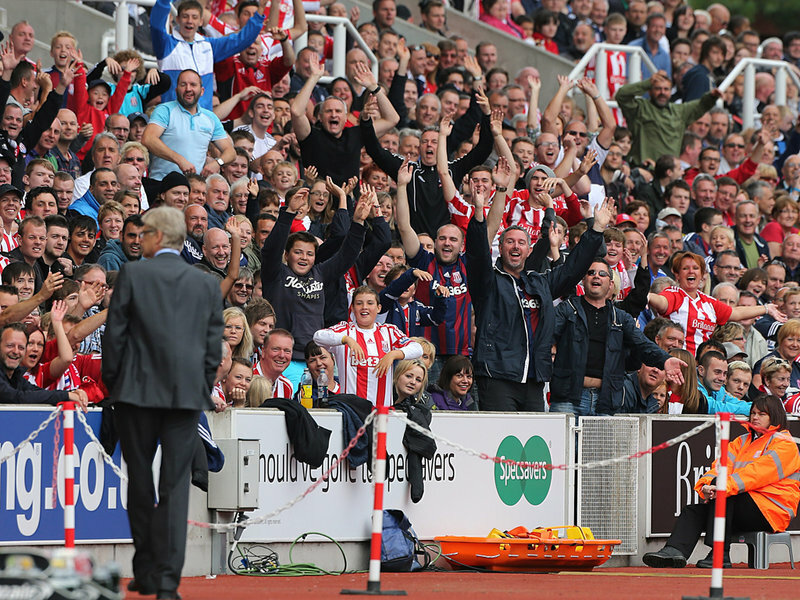 Since the Potters were promoted back to the top flight in 2008, Arsenal have won just one of their seven visits to Stoke, including an F.A Cup defeat at that ground in 2010, a month before their sole Premier League victory there. However, Mark Hughes’ men have struggled at home this season, losing three of their six matches. Although only five points off the top four, Newcastle, Liverpool and Tottenham all look too inconsistent to mount a serious challenge to end up in the Champions League places. Liverpool actually recorded two wins over the last week, beating Stoke 1-0 at Anfield thanks to a late Glen Johnson goal, then coming from behind to overcome Leicester 3-1 at the King Power Stadium. By contrast, Newcastle found themselves sliding down the table as they followed up their 1-0 defeat at Upton Park with a 1-1 draw away at Burnley. Although Tottenham were soundly beaten by Chelsea in midweek, they did at least record their most impressive performance of the season last Sunday, beating Everton 2-1 at White Hart Lane. What was even more amazing was that it was Roberto Soldado who scored the winner – if he cannot go on to show any sort of form now he has finally ended his barren spell, then he will never be a success at the club. Unfortunately, that’s exactly what I think will happen. It turned out to be a bad week for the Toffees, who were held in midweek at home against a struggling Hull side. The single point they picked up in the last seven days leaves Everton in 11th place, two points behind the trio of teams ahead of them and in desperate need for a string of good results to push themselves up the table. It will be hard for them to start that this weekend as they head to the Etihad to face Manchester City, while Newcastle host league-leaders Chelsea. Liverpool and Tottenham will be hoping for wins this Saturday, as they host Sunderland and Crystal Palace respectively. I would be surprised if either Aston Villa or Stoke ended up getting dragged into the relegation battle, even though neither could consider themselves a comfortable distance from the drop zone (Villa 4 points, Stoke 3). I would also be surprised if either club ended up higher than 10th in the table, their current positions of 12th and 13th to be about where they will end up. In the last week, Stoke had those two narrow defeats against Liverpool and Manchester United, while Aston Villa were held to a draw at Burnley before beating Crystal Palace 1-0 at Selhurst Park. This weekend, the Stoke fans will be hoping to get under Arsene Wenger’s skin once again when Arsenal come to town, and Villa host Leicester City on Sunday. The bottom seven teams are separated by just four points and the gap between Sunderland in 14th and the relegation zone is only half that amount. Leicester are now rock bottom of the table after their 3-2 defeat away at QPR last Saturday, which lifted Harry Redknapp’s side to the giddy heights of 19th. Both the Foxes and Rangers followed up that match with defeats in midweek, against Liverpool and Swansea respectively, and the other team in the bottom three, Burnley, had two 1-1 draws with Aston Villa and Newcastle. Sunderland recorded that impressive 0-0 draw with Chelsea, before losing their home winning streak over Manchester City with a 4-1 defeat. West Brom could not take advantage of their two home fixtures against London opponents, as both Arsenal and West Ham beat them; Crystal Palace got an impressive point away at Swansea, but then lost to Villa in front of their own fans; and Hull’s rot came to an end with their 1-1 draw at Everton, that came on the back of a 3-0 defeat at Old Trafford. This weekend, two of the bottom three meet at Loftus Road, as QPR host Burnley; 17th faces 16th as Hull entertain West Brom; Crystal Palace have a London derby against Spurs at White Hart Lane; Sunderland travel to Liverpool; and Leicester play Aston Villa on Sunday.